White Chocolate Flavored Sugar Free Instant Pudding and Pie Filling Jell-O White Chocolate flavored sugar free pudding mix makes an amazing dessert. Its rich flavor and creamy texture is bound to make you & your guests miss your grandma's homemade pudding. Both, kids and adults love its rich flavor and luscious creamy texture!It does not require a lot of time and effort to prepare. Hence, all- time favorite dessert and snack with lesser calories! Use the pudding between layers of a layer-cake or add it to cake batter for a moister cake, or use in trifles, to add classic White Chocolate flavor without adding a lot of calories.Silky Texture, Divine Flavor yet Lesser Calories!Everyone loves the flavor of a creamy, rich, White Chocolate pudding. Its sugar free; can be enjoyed as a low calorie snack anytime of the day or even night! The perfect guilt free cure for midnight dessert cravings is Sugar-Free White Chocolate Instant Pudding. This pudding mixes easily and sets consistent every time. 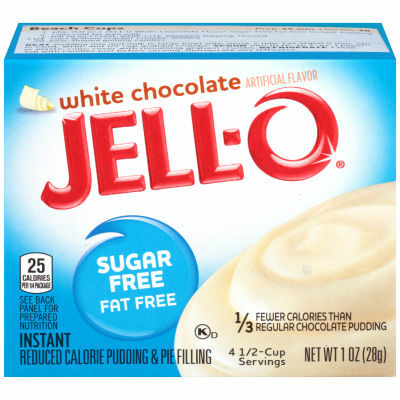 When you have to serve a low calorie dessert, instantly, Jell-O White Chocolate flavored sugar free pudding is the best, with a deep rich White Chocolate flavor.